The first step is to look at the original content, as the crawler will see it, by making a simple HTTP request to the original web server. With the old Squiz forums as use case. However, that doesn't mean that the content is not problematic, because browser are usually smart (smarter than our crawler) and can automatically fix a number of encoding-related errors. Additionally, collecting more info on those corrupted characters will help us later. Our use case seems to be related to processing entities, and so it's probably not related to actual encoding problems on the original document. When that's the case, other information is useful to lookup. What is the encoding declared in the HTML source? In our case it's ISO-8859-1 as seen in the <meta charset="iso-8859-1"> tag. What is the encoding returned by the webserver? It can differ from what's in the page, and that's usually a source of problem. 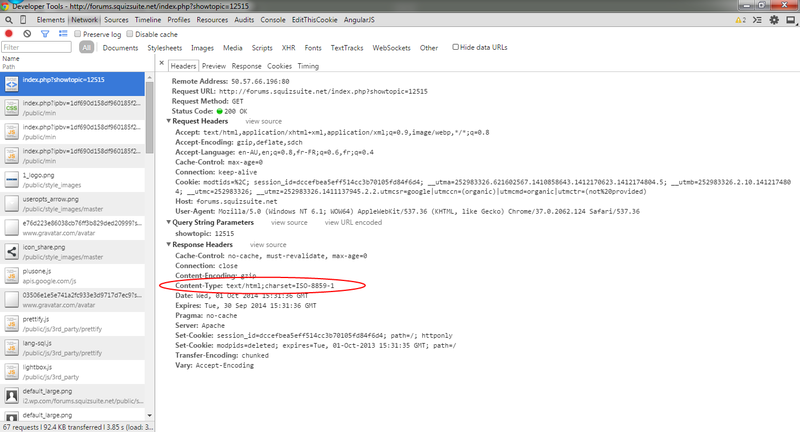 Alternatively, use wget (observe the Content-Type header at the bottom. Terminal - Get HTTP header of page. 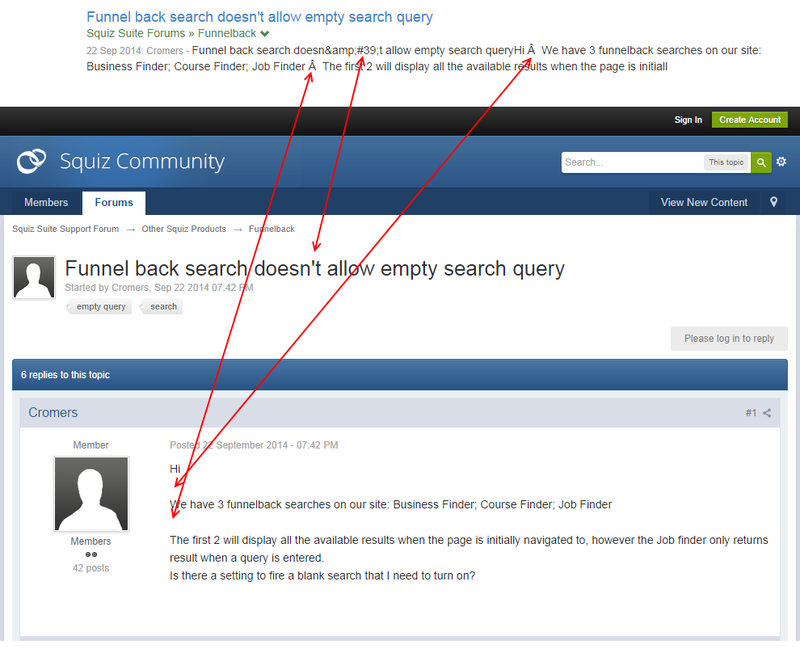 Connecting to forums.squizsuite.net (forums.squizsuite.net)|50.57.66.196|:80... connected. In our case, the Content-Type returned by the server and the Content-Type declared in the page match. Sometimes, they don't, because the content author usually don't control the webserver. When they don't match, browser will use various heuristics to try to find the "right" one. The Funnelback crawler will follow an order of precedence, and you can ask RnD what encoding is considered first (either Response header, or page content). What is the actual encoding of the page? Despite encoding values being returned by the web server, and/or the page META tags, it's possible that both of them are lying and that the content is actually encoded differently. The only way to find that out is to use an hexadecimal editor, and to inspect the content at the byte level to see how it's actually encoded. In our specific case it doesn't matter because special characters are encoded as entities, but that's something you always need to confirm. Consider the following HTML document: Character encoding example. If you look at it's byte representation, you'll see that the "ç" is represented with 2 bytes 0xC3 0xA7. That's actually UTF-8, not ISO-8859-1. If the page was encoded in ISO-8859-1 as it claims, it should have been a single 0xE7 byte. Incorect Output: Byte representation of HTML Character encoding example.